The London Chess Classic got off to a sluggish start, but I’ll tell you who I thought fought the hardest in the first two rounds. We will also look at a near upset in the concurrent British Knockout Championship, and finally enjoy a spectacular early game from the Russian Superfinal. The usual suspects are playing in the London Classic, a ten-player round robin. None of the games from the first two rounds produced a decisive result. 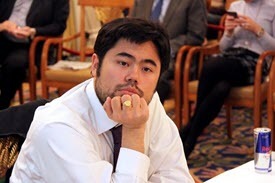 I think that Hikaru Nakamura at least came close, so we will take a look at how his tournament got started. 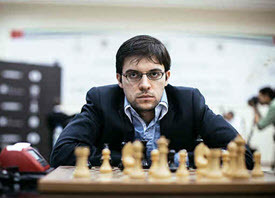 First, he played White against Anand. Next up, Naka essayed the Modern Dragon, which has been absent at the highest levels for a long time. Let’s see how he and MVL traded punches in the Yugoslav attack. Nigel went down in the second round at the hands of Luke McShane. 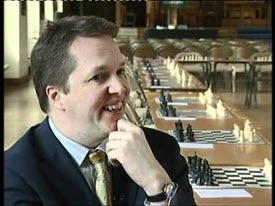 David Howell defeated Matthew Sadler to become the other finalist. I’ll let you know how it all turns out next week. The Russian Superfinal is missing several of their usual suspects—Kramnik, Grischuk, and two of the players in London, Karjakin, and Nepomniachtchi. Still, without marquee names, it is still a powerhouse event, and we will see some of the younger players make a name for themselves. One player who got off to a brilliant start is Daniil Dubov, who notched an impressive victory over Sergey Volkov in the first round. 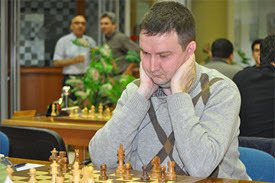 Dubov won in the second round over Peter Svidler, and he has been matched so far by Vladimir Fedoseev, who beat Riazantsev and Tomashevsky. The Classic and the Superfinal are both in their early stages, so we will see how they progress. The Classic will be over by next week’s show, while the Superfinal will continue until the 15th.